Enjoy bright, clear images with the NEC NP-MC382W 3800-Lumen WXGA LCD Projector. Its 3800 lumens of brightness can overcome ambient light in most conference room and classroom settings, while its 16,000:1 dynamic contrast ratio can help ensure discernible detail in most images. 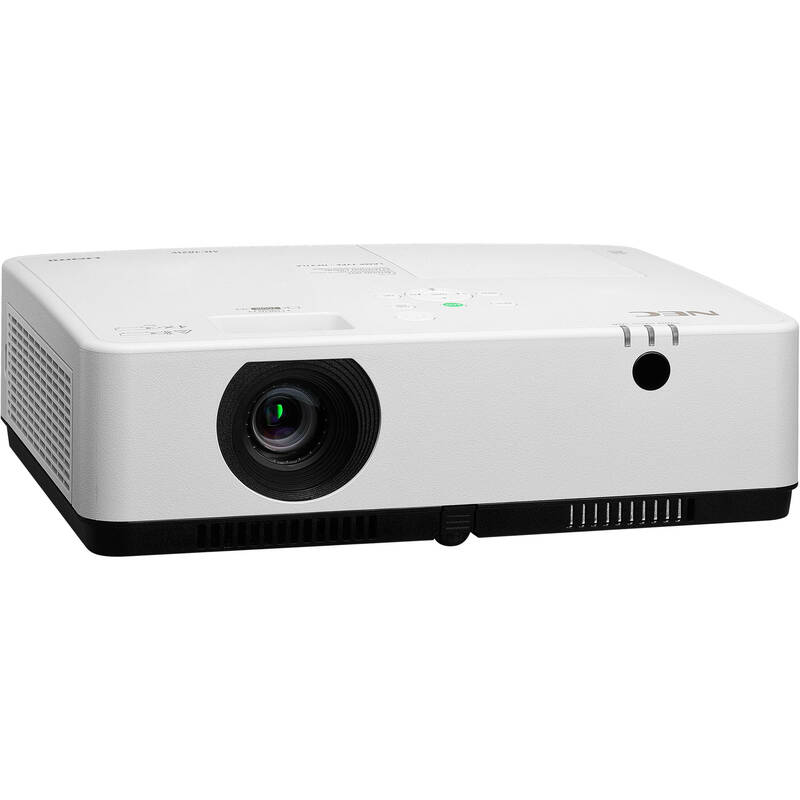 The projector's native WXGA 1024 x 800 resolution is suitable for most video and file formats, and will accept up to 4K UHD sources. This feature helps ensure detailed images when non-native resolution sources are projected. AutoSense is designed to sync the projector with most computer signals. It also features one-touch image optimization. Presets provide for adaptive color tone correction for projection on non-white surfaces. This feature allows for horizontal, vertical, and diagonal image correction to help you achieve aligned images when the projector is set up at an angle to the screen. Geometric correction lets you project onto spheres, cylinders, corner angles, and more. Insert a compatible USB drive directly into the projector and flip through images using the remote control. The NP-MC382W accepts resolutions up to 4K UHD to offer a measure of future-proofing. The built-in 16W speaker is designed to provide the volume needed for most conference rooms. Having VGA, RCA, and two HDMI inputs enables you to quickly switch between presentations from different sources. The HDMI ports support HDCP, so you can project from Blu-ray players, cable boxes, satellite receivers, computers, and more. Play JPG files stored on your USB drive without a computer. The integrated Ethernet connection enables quick connection to your LAN via 10/100 base-T.
You can adjust the volume of an external speaker system using the projector's remote control. Crestron RoomView provides unified management, including the ability to turn the power on and off for multiple projectors connected to a network. You can monitor and make adjustments to the projector from a remote location. Closed captioning enables the decoding and display of text information from a video. The projector and remote feature direct access buttons for source selection. This mode helps extend lamp life, lower audible noise, and reduce total cost of ownership. This meter calculates the effects of operating the projector in ECO Mode. A green ECO Mode button on the remote control enables one-touch mode activation. Power management enables the projector to automatically turn off when an incoming signal is not detected from any of the inputs. These features allow you to start presenting within four seconds and enables immediate power off with no cooling required after shutdown to help ensure efficient energy usage. This feature powers the projector on as soon as it's plugged into a power outlet. Direct Power Off helps protect the lamp when the projector is accidentally unplugged by enabling the fan to continue running until the lamp is properly cooled down. Internal sensors monitor lamp temperature and prevent the lamp from powering on if it's too hot. Transmit images from your computer to the projector wirelessly with the optional NP05LM1 wireless LAN adapter. Box Dimensions (LxWxH) 17.5 x 15.3 x 7.6"